A presentation skills training course that will give you confidence and credibility and have your audience engaged and motivated. Complete Presentation Skills is a comprehensive presentation skills training course that covers all five facets of presenting in depth. experienced presenters who are ready to take their skills to the next level. Many people tell us that it takes them far too long to prepare a presentation and that they struggle to make the presentation interesting and engaging for the audience. We’ll show you how to significantly reduce the time it takes to prepare a presentation and how to make it come alive for the audience. You’ll apply the principles we teach you by designing a presentation. The concepts we show you will be reinforced by you delivering and receiving feedback on segments of your presentation. Many people lose their natural ability to warmly communicate when they stand in front of a group. Instead they “speechify” and become stiff and pompous or panicky and speak too fast and lose their connection with the audience. In this module you’ll learn how to use the techniques that you unconsciously use in everyday conversation to connect and communicate with your audience. You’ll become relaxed and in control of what you say and how you say it. engaging your audience at an emotional, as well as logical, level. We use video to give you accurate feedback on how you come across. At first intimidating, most people find this really helpful and often, it’s actually a confidence booster! Nervousness about speaking in front of a group is a very common experience. A speaker’s confidence is also a key factor in how credible they appear. Because of its importance we put a particular emphasis on handling nervousness and developing confidence in our training. We’ll introduce you to psychologically-based strategies that you can use to significantly increase your confidence. We take nervousness seriously. The strategies we teach you are based on Rational Emotive Behaviour Training – a proven cognitive-behavioural technique. PowerPoint is an excellent tool when properly used. Unfortunately most presenters don’t know how to make the most of it and so it becomes a visual impediment rather than a visual aid. We’ve thoroughly investigated the latest research in multi-media learning and integrated that with our knowledge of PowerPoint to help you make your slideshow something to stimulate – not sedate – your audience. Looking bored or talking to somebody else in the audience. You’ll choose a situation that concerns you that you’d like to handle better. Through our coaching you’ll develop and practice strategies for successfully dealing with the situation. At the end of the session, you’ll feel significantly more able to calmly handle the uncertainties you may encounter. As part of the course you’ll receive a copy of our 100-page Presentation Skills Workbook “How to design and deliver a presentation with confidence”. The workbook is used throughout the course and is also a valuable reference tool for the future. You’ll also have continuous access to your final presentation and the subsequent “instant-replay” coaching session on our secure video-streaming service. Complete Presentation Skills can be delivered as a blended learning option where participants complete the the requirements of Day 1 remotely and Day 2 is delivered in a live-course environment. 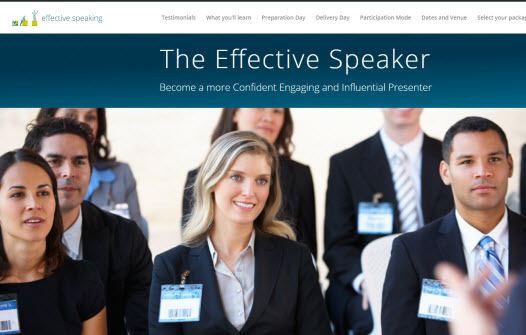 Check out “The Effective Speaker” running in Wellington – May 1 & 2, 2019. Become more memorable and persuasive. Want to find out whether we can help? We're happy to talk - after all, speaking is what we teach!